Speed limit signs were recently changed at the site of one very profitable new speed camera in College Park. 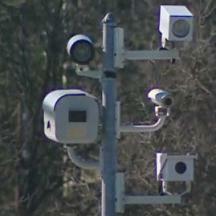 The camera, located near the 3200 block of Metzerott Road, was added on November 16th, 2010. Photos obtained by StopBigBrotherMD .org of that camera site show that the speed limit on eastbound Metzerott Road is 40mph until less than 1/10th of a mile before the camera, where a sign for “Speed Limit 30” is located. However Google Street View images of that same area show no 30mph sign present in that location. Instead a ‘reduced speed ahead’ sign (with no speed limit shown) was located just before the 3200 block, where the 30mph sign is now. The "Reduced Speed Ahead" sign has apparently been replaced by the "Speed Limit 30" sign, effectively shifting the start of the posted 30mph speed limit zone to this point. In the Google Street View images, the first 30mph sign was located approximately 1/3rd of a mile farther to the east near 35th street, well past the current location of the camera. As such, the Metzerott Road speed camera is apparently enforcing a 30mph speed limit at a point where a 40mph speed limit would have been in effect not long ago. A resident in the area reported to us that he first saw the new 30mph sign in mid November, close to the date this camera started issuing tickets. Other evidence we have received (which we are withholding for now at the request of our source) supports the fact that this 30mph sign was added in November 2010. StopBigBrotherMD.org sent an email Thursday evening to several College Park officials asking for their comments on this, and asking several questions, but we have not yet received a response. The camera appears to be enforcing speed limits in both directions, and this type of camera is capable of that. In the westbound direction, leaving college park, the camera (presumably enforcing a 30mph speed limit) is located approximately 100 yards east of a 40mph sign. This sign appears in legacy Google Street View images, however in those images the sign is obscured by brush along the road until the drivers are closer to it than the camera site. In the recent photos (showing the camera) the 40mph sign is clearly visible before drivers reach the camera (either because trees have lost their leaves, or because trees have been trimmed), and a new yellow “40mph ahead” sign has been placed between the camera site and the 40mph sign. Drivers leaving the 30mph zone and the town are now facing, and should be able to see, a sign stating “Speed Limit 40” prior to passing the camera in the westbound direction (but still legally inside a 30mph zone). While 'reduced speed ahead' signs are common, 'increased speed ahead' signs are rare. Such a sign would seem to send the message "prepare to speed up", which would be a strange message to want to send if there were enough of a speeding problem to justify a speed camera for safety reasons. We have inquired with the city whether the camera is in fact enforcing a 30mph speed limit in both directions, and about the rationale for adding this sign, and we are awaiting a response. According to a recent story in the Gazette, this single camera issued 7,994 tickets in the first 3 week period. College Park has three camera sites total, with the other two on Painted Branch Parkway and Rhode Island Avenue issuing only 669 citations during that same 3 week period. The tickets issued by the three cameras combined would be worth $346,520 in fines for that three week period, to be divided between College Park and their contractor Optotraffic. Even if revenues from this one camera were to drop by over 60% for the rest of the year, due to people learning the location, it seems likely this one camera could generate well over $1million in fines over its first year. Unlike "school zone" cameras used elsewhere in Prince George's County which only run on weekdays, College Park's cameras are permitted to operate 24/7 under a change made to state law in 2010. We previously discovered a similar situation with the cameras on Route 1 in Mount Rainier and Brentwood, where the speed limit was lowered at two camera sites, a fact later confirmed by the Washington Examiner. The speed limit was also lowered on a local road in Brentwood to 15mph at another camera site on a local road. The town of Cheverly lowered speed limits on many local roads in that town by 5mph shortly before beginning their speed camera program. While it is sometimes necessary to revise speed limits or speed limit signs from time to time, there does seem to be a trend of speed limits being revised downwards at precisely the time speed cameras are being added. If a rationale for changing speed limit signs existed, did it not also exist a year ago? And while all of this is likely to be legal, the question one might ask is whether some local governments have started creating new "speeding problems" by reducing speed limits which they can then "fix" with profitable speed cameras placed near new speed transition zones? If you received one of the 7,994 tickets issued by this camera then perhaps that question would be best directed to College Park Officials.